Have you received your tax refund yet? Chances are good that if you were owed a refund, your return has been delayed. The government shutdown caused the IRS to furlough workers during some of the most important weeks for processing tax returns. And it’s taking the agency time to catch up. So even if you were responsible and filed your tax return well ahead of the crowd, you may still be waiting on your refund check. But today, I want to show you why this delay could actually lead to a much bigger check for you. In fact, whether you’re expecting a tax refund or you’ve got to write that dreaded check to Uncle Sam, this tax refund delay can help you capture some unexpected wealth. There’s been a lot of talk about tax refunds recently thanks to the new tax bill that went into law last year. The new tax bill lowered the tax rate for most Americans, but also made major changes to what deductions families and individuals can make. We’ve talked about many of these changes here at The Daily Edge, including the lower withholding rates that have allowed Americans to keep a larger portion of every paycheck throughout the year. Now that it is time to turn in your tax return for 2018, many of those changes are under scrutiny. I’ve become keenly aware of these issues in part because my brother is an accountant and is currently up to his neck in personal and small business tax returns. I got a chance to see him over the weekend and he was exhausted. It’s been a stressful year as he has had to work extra hard to make sure that all of the changes are being taken into account for the tax returns he prepares. 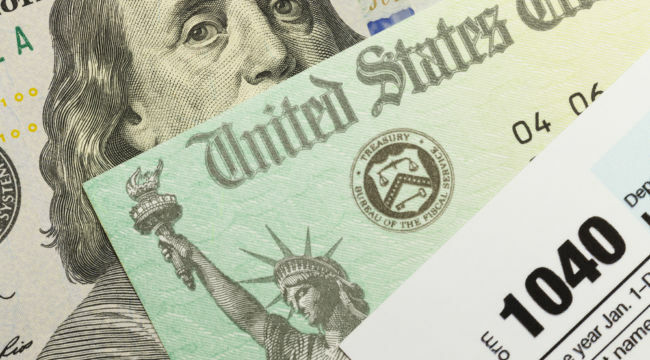 So these are two big issues that are causing a delay in the tax refunds Americans would typically be receiving this time of year. First, the IRS was closed, causing a pileup in the number of returns waiting to be processed. And second, individuals and business are taking more time to actually file their return because it is taking some time to handle the changes from the new tax bill. This has had a pronounced effect on retail spending in the United States, which in turn is setting up an interesting opportunity for investors. Wall Street has been a bit frustrated with how the delay in tax refunds has affected spending in the United States. You may have heard that recent reports on total retail sales have come in a bit weak. And those “weak” readings have naturally sent some retail stocks lower. After all, Wall Street is worried that lower tax returns could lead to disappointing profits for retailers. Those tax refunds aren’t “gone.” They’re just taking a little longer to work their way through the system. Which means American consumers will still be spending the cash that they get back from Uncle Sam. The spending may have just been deferred from February and March to heavier spending in April and May. So what does that mean for us here at The Daily Edge? Well I’m expecting those refund checks to drive surprisingly strong retail sales in this new second quarter of 2019. And I expect those strong sales to catch Wall Street investors off-guard. Over the past couple of months, a few key retail stocks have been stuck in a holding pattern waiting for good news to hit. Shares of Wal-Mart Stores (WMT) for example are trading at the same level from late January. And shares of popular retailers like Target Corp. (TGT) and TJX Companies (TJX) have just barely made back losses from late in 2018. The stock prices for these retailers are being held back in part because many taxpayers haven’t yet received their refunds. And so they’re not in a rush to head out and spend that cash. But this month, as accountants wrap up their customers’ tax returns and the IRS catches up on its inflated workload, we should see tax refunds making their way to retailers around the country. And as these retailers start reporting strong spring sales, stock prices will be poised to jump higher. If you’re one of the forward thinking investors who owns shares of these retailers, you’ll be in prime position to profit from a jump in sales. So as we head toward the April 15th tax filing deadline, make sure you are positioned to profit from all of those shoppers who will be taking their checks to spruce up their spring wardrobes!